Sunday Exclusive! 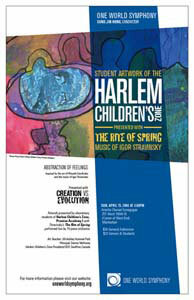 One World Symphony collaborates with the Harlem Children's Zone Promise Academy to present Abstraction of Feelings. The question of our origins has haunted the collective imagination since the beginning of time. 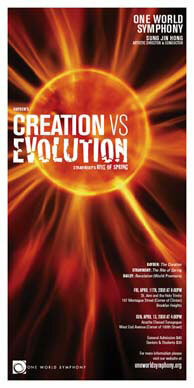 This spring the concert hall will bear musical witness to the exploration of this controversial matter with works such as Stravinsky's primal The Rite of Spring (depicted as evolution in Disney's landmark film Fantasia) and Haydn's celebratory oratorio, The Creation. Making his debut with One World Symphony, composer Keith Bailey will present his world premiere, Revelation, a mystical sound-world that evokes a cryptic light punctuated by fanfare. Click here for cast details!